From company summer festivities to family reunions, badge ribbons are perfect for every occasion. Stand out from any crowd with bright, fun and festive badge ribbons. Each ribbon is useful in making an initial introduction when worn with a name badge. They help to break the ice for those attending social meetings and get-togethers. And, it is always fun to think outside the box to come up with unique ways to personalize these badge ribbons. While name badges are the usual place to find a badge ribbon, these identification tools are perfect for imaginative uses. From group identifiers to getting to know you games, these ribbons help add flair to any event or function. And, here are a few ideas to get you started! No matter the size of your family, getting everyone together in one place and at one time is a massive undertaking. And making sure that everyone in attendance knows each other can be a daunting task. 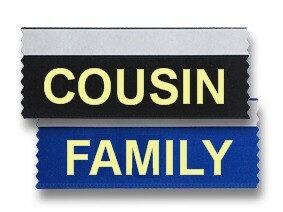 From colors to fun titles like Cousin or Great-Aunt, badge ribbons are an excellent way to identify people. Start with name badges so that everyone won’t be guessing people’s names all day. Then, attach badge ribbons to familiarize each other with how they are related. Create custom ribbons with words such as father, aunt, cousin, sister or choose the last name to indicate from which family line they originate. Fundraisers are also a common place to see badge ribbons. These ribbons are a fantastic tool for identifying a cause or support group for each fundraiser. Choose a color, such as pink for breast cancer support or a rainbow ribbon for autism supporters, and then add a title or function for the wearer to attach to their name badge. 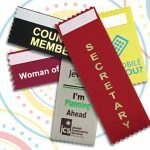 Stacking personalized ribbons on name badges is an effective way to identify any role at these and other events. Titles are a typical thing to see imprinted on badge ribbons. However, use your imagination and come up with fun things to add to these promotional ribbons. They don’t always have to be professional. Add silly things that will make them memorable such as Coffee Fiend or Here For The Food. Let attendees pick out something that describes their personality so others at a conference or corporate meeting will feel more at ease. Badge ribbons are inexpensive and come in both horizontal and vertical designs and can be customized to meet any need for any function. Don’t limit yourself while using these tremendous personalizing tools. Even order blank ribbons to quickly identify specific groups by a single color worn by each person. Parties and summertime go hand-in-hand. And so do family reunions! No matter the size of your family, getting everyone together in one place and at one time is a huge undertaking. And making sure that everyone in attendance knows each other can be a daunting task. Recently there was an online article about a family reunion with over 200 people in attendance. Crazy! So, what did they do to keep things as functional as possible? They gave everyone small strips of paper to write who their ancestors were. This helped to keep track of how everyone was related. We’re taking this one step further! What about using badge ribbons? 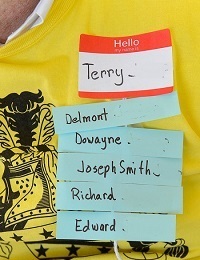 Not only can these ribbons be used to label someone, but what about using blank ribbons to feature the names that associate you with those around you at the reunion? In the article, the attendees were given blue papers for male names and pink ribbons for female names. If you don’t want to use this fun color idea, check out all the color options we have available! Badge ribbons are also an excellent way to identify people. Start with name badges so that everyone won’t be guessing people’s names all day. Then, attach badge ribbons to familiarize each other with how they are related. Create custom ribbons with words such as father, aunt, cousin, sister or just choose the last name to indicate from which family line they originate. Also, don’t forget the name badges so people can remember what the attendee’s name is! 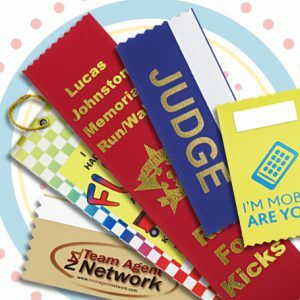 From family reunions to summer work parties, another great use for these blank badge ribbons is party games. Use the different colors for different games or organization during the festivities. Design your own game using badge ribbons and either focus on the colors or write on them with a permanent marker. Whatever your need at your next family reunion or party, make sure to remember that people need to be recognized and identifiable!